The Mustang was a small hardy range horse used by the Great Plains Indians descended from horses brought by the Spanish conquistadors. The Mustang became widespread on the prairies and Great Plains of North America. The introduction of the horse by the Europeans led to a period in history of the Great Plains Indian history called the Indian Horse Culture. 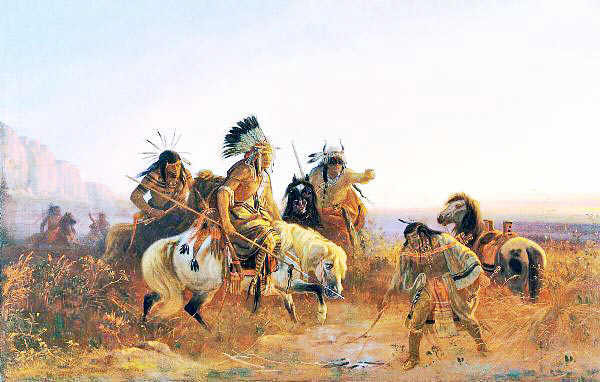 The Native Americans had never seen an animal like the horse, nor had they imagined that such an animal could be tamed and used as a means of transport and hunting. The Mustang horse is often called "The Symbol of the American West." The Mustang horse is known for its endurance qualities and athleticism.